By Chris Williams: Bob Arum says he’s absolutely serious about wanting to make the Terence Crawford vs. Errol Spence Jr. fight, and he doesn’t want to wait around and let the fight marinate. Arum, 86, says he’s ready to make the Crawford-Spence fight now, but it takes two to make the fight happen. Arum is finally ready to take Crawford’s career into hyper drive in pushing for the Spence fight now rather than later on down the line in four to six years. Who can blame the 86-year-old Arum. That fight needs to get made now. Spence says Crawford is on the other side of the fence, and that presents a problem because of the two fighting on different networks. Crawford competes on ESPN, whereas Spence fights on Showtime. For Crawford vs. Spence PPV fight to take place, it would need to be a dual network effort, and the two of them haven’t achieved the popularity yet for that to be feasible to the networks. Crawford (34-0, 25 KOs) is 31-years-old now, and he needs a big win over IBF welterweight champion Spence (24-0, 21 KOs) and/or Keith ‘One Time’ Thurman for him to become a star. The Top Rank CEO Arum figures that it would take little more than three hours to put together a Spence vs. Crawford deal together if Errol’s management wants to get it done. “I think we’re talking about March or April for Terence to come back,” Arum said to the boxing media. “I think Terence looked good in the fight, but so did Benavidez. We’ve had Benavidez since he was 17. We knew what a talent he was,” Arum said. Arum doesn’t have anyone in mind for Crawford’s next fight other than Spence, which isn’t likely to happen. It would be a shame if Crawford’s next fight is against the Top Rank promoted former WBO light welterweight champion Mike ‘Mile High’ Alvarado (40-4, 38 KOs), who the promotional company is keeping around for some reason. Alvarado is 38, and is seen as over-the-hill by many boxing fans. It’s a predictable fight for Arum and Top Rank to make in matching Alvarado against Crawford. The boxing fans would be furious at seeing such a mismatch, but that wouldn’t be the first time that the fans were upset with the way Crawford is being matched. The fans didn’t want to see Crawford fighting Benavidez, Felix Diaz, Thomas Dulorme, Dierry Jean and John Molina. The fights still happened. Crawford beat Benavidez (27-1, 18 KOs) by a 12th round knockout this month on October 13 in a competitive fight on ESPN in Las Vegas, Nevada. Crawford-Benavidez brought in good ratings on ESPN despite the fact that there was little interest from the boxing world in the fight until the week of the fight. Crawford took a lot of heat for fighting Benavidez, as he’s not viewed as one of the top 10 welterweights in the eyes of a lot of boxing fans. Benavidez was ranked #14 by the World Boxing Organization at the time that Crawford gave him a voluntary title shot. Benavidez got the fight because he was with the same promotional company Top Rank as Crawford. “As far as I’m concerned, let’s do the best fights as soon as possible. Forget about marinating,” Arum said. It would help if Arum would be willing to forgo the mismatches that we’ve been seeing between Crawford and guys that don’t belong inside the same ring with him like Jeff Horn, Benavidez and Julius Indongo. If the Spence fight can’t get made right now, Arum should reach out to Al Haymon and try and setup fights between Crawford and Shawn Porter, Danny Garcia and Keith Thurman. Those would be big fights. Crawford just needs that one big fight to get him over the hump to make him a big enough star for the Spence fight to be more enticing enough to make it a dual network broadcast. There’s not enough money in the Spence vs. Crawford fight right now to split the fight between ESPN and Showtime. That could change with the right match-making for the two stars. Spence wants to fight Shawn Porter and Thurman, and those are both realistic fights that can be made. Porter vs. Spence is likely going to happen in the first half of 2019. Thurman-Spence will need to wait until Thurman gets back in the ring and gets a few fights under his belt . “The best fight at lightweight is [Vasyl] Lomachenko against [Mikey] Garcia,” Arum said in saying the obvious. “If Lomachenko is successful against [Jose] Pedraza, do the fight [Garcia vs. Lomachenko] right away. Also, there’s no reason to do any fights for Terence and Spence unless they fight each other, but again, it takes two to tango. I really mean that. I’m not playing games. They want to make that fight. They can make it. It’ll take probably three hours to do a Crawford-Spence fight,” Arum said. Lomachenko vs. Garcia is going to be even tougher to make than the Crawford vs. Spence fight, because Mikey wants to move up to welterweight to take on Errol. Mikey will likely come back down to lightweight, but he seems to be reluctant to take the fight against Lomachenko for some reason. Mikey is not in a hurry to make that fight happen right now. There’s a lot to lose for Mikey in getting beaten by Lomachenko, and not as much fallout in losing to a bigger, stronger fighter like Spence. ”We prefer Spence or Thurman,” Crawford’s trainer Bo Mac said to Fighthype when asked who he wants for Crawford to fight. ”We’re getting older now. Terence said he wants to call it quits in the near future, so we might as well go about and get the big guys out there and the other champions. They don’t want none of that work. They see what Terence do to people. He ruins careers,” Bo Mac said without mentioning which fighters Crawford supposedly ruined their careers. Crawford obviously isn’t ruining careers, as Bo Mac says. What might make the other top welterweights reluctant to fight Crawford is the fact that he’s a switch-hitting counter puncher, who moves a lot around the ring. Those are three strikes that Crawford has against him. No one wants to fight a southpaw, and Crawford is quite proficient using that stance. But when you add in all the movement that Crawford uses, it makes him a difficult style to prepare for. The last thing that the top welterweights want to deal with is having to adjust to all the different things that Crawford can do inside the ring to make his opponents uncomfortable. If there was a ton of money for the top welterweights to make in fighting Crawford like there would be if they fought someone like Floyd Mayweather Jr. for instance, then they would obviously face him in a second. Unfortunately, Crawford isn’t a PPV star and likely will never be one. ”Probably Thurman,” Bo Mac said when asked who the toughest fighter is for Crawford between Spence and Thurman. ”You see what size does to you. Nothing. When he beat [Jose] Benavidez, Benavidez was way bigger than him and taller, but that didn’t mean nothing. His punches didn’t even move Terence. 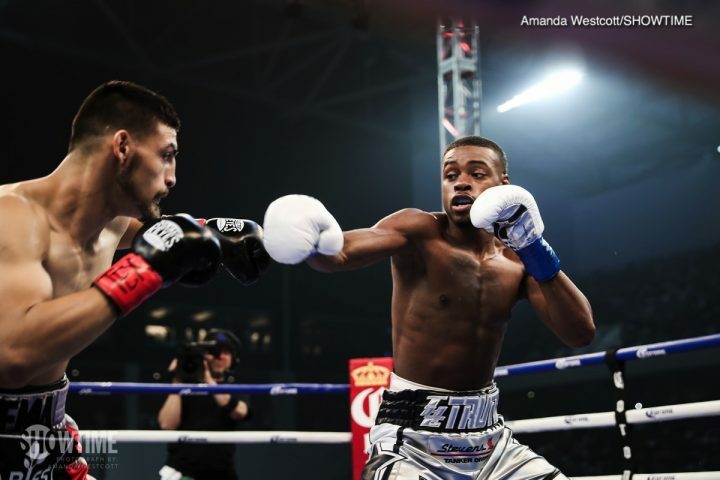 Size doesn’t mean anything,” Bo Mac said in continuing to expound on his theory that it doesn’t mean much that Spence is a lot bigger than Crawford. It’s interesting that Bo Mac is comparing Benavidez with Spence, and lumping them in the same boat. That’s crazy the way Bo Mac is minimizing Spence’s talent by comparing him to Benavidez, who can’t punch at all. The only thing Spence and Benavidez have going for them is they’re both big. The comparisons end right there. Spence is a southpaw, powerful beyond belief for a welterweight, and a relentless pressure fighter and body puncher. Benavidez is light hitter, who has never been viewed as an elite fighter at 140 and 147. It’s worrisome that Bo Mac seemingly can’t tell the difference between the talent levels between Spence and Benavidez. The fact that he can’t tell the difference would make me worried about having him as my trainer if I were Crawford. How can a trainer prepare you properly if he isn’t able to tell the difference between a mediocre fighter and a talented one? If Crawford ever does fight Spence, he’s going to be in trouble if he’s not getting the right kind of preparation to let him know what he’s got in front of him. Crawford will get chopped to pieces by Spence if his trainer is telling him repeatedly all throughout training camp that Errol is no different than Benavidez. ”Thurman, he’s mobile, and good with his punches from different angles,” Bo Mac said. ”Let’s hope he is,” Bob Mac said about him hoping Thurman is the same fighter he once was when he returns from his long layoff. ”I hope he is because they’re going to say you beat a guy that was out for a long time and you really didn’t fight nobody,” Bo Mac said in worrying about Crawford not getting credit by boxing fans if he beats Thurman coming off of a long layoff.